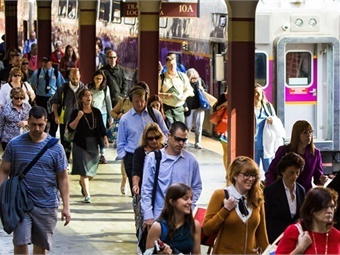 The Massachusetts Bay Transportation Authority (MBTA) and its commuter rail operating partner Keolis announced today that the Worcester Commuter Rail Line Improvement Project will begin on Saturday, Aug. 25, and continue through Saturday, Oct. 20. This project involves replacing 38,000 feet of rail along the corridor of the Worcester line. This eight-week improvement project may lead to 5- to 10-minute delays for some trains operating on weekends and some trains operating after the morning rush hour on weekdays. No weekday morning rush hour trains will be impacted. In addition, in order to accommodate the improvement project and assist customers with planning their trips, three mid-day weekday trains will be re-timed to depart 10 minutes later than the normally-scheduled time. This work is in addition to 200,000 rail ties and 10 miles of rail that have already been replaced by Keolis and MBTA crews over the last four years. Improvements to this infrastructure help to improve service. For example, the previous work to replace rail ties helped to reduce the impact of heat-related speed restrictions during the summer by 97% from 2015 to 2017.